Many of us love to start our morning with a cup or two of coffee to get us going. And we're appreciative of gifts that acknowledge that we love our coffee! These gifts don't need to cost much for them to be a hit with us! Popular gift ideas include mugs (we can never have too many coffee mugs) and different varieties of our favorite beverage. But there are many other fun gift ideas for the coffee lover, including gift baskets, books, calendars, and even ornaments. Here are a few inexpensive gift ideas for you to start your search for your coffee-loving friend or family member. 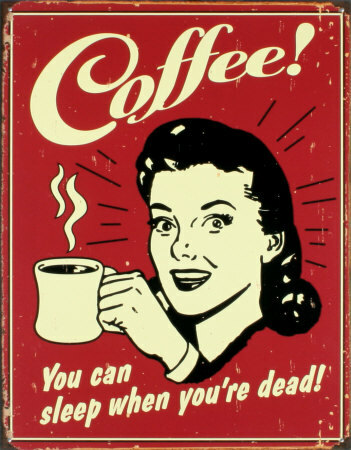 I love my coffee, and all of my friends and family know it! Therefore, it's easy for them to find a gift for me that they know I'll enjoy. Over the past few years, I've received a number of inexpensive but greatly appreciated gifts, including different varieties of coffee, a few wonderful mugs, a coffee-themed gift basket, and a fun (and very pertinent) poster, as you can see here to the right. If you're looking for the perfect gift for your coffee-loving friends or family, I have a few suggestions here that may be just what you need! Kona Coffee grows only on the slopes of two of the volcanos in Hawaii and is considered to be one of the top gourmet coffees of the world. It's more expensive than most other varieties of coffee partly because of its limited supply but also because of its high quality. Kona coffee beans are hand-picked because machinery-picking is difficult on the slopes where it grows. But that also means that only the best and ripest berries are picked which is the reason behind its high quality. Because of its cost, many people shy away from buying kona coffee for themselves for every day drinking. Therefore it makes a great special gift for the coffee lover. It is not expensive compared with many other gifts you might buy, and it will be a treat for someone who would not normally spend the money to buy it themselves. 8 oz Grande Domaine - the "grandaddy of Kona Coffee". Chocolate and coffee are divine together! These Chocolate Covered Kona Coffee Beans are another special gift idea from Koa Coffee Plantation. These are made with peaberry beans, considered to be the "champagne" of Kona Coffee. The beans are roasted to perfection then hand-dipped with a rich semi-sweet chocolate, and finished off with a light touch of mocha. They'll go perfectly with a cup of Kona coffee, but of course they can be eaten all by themselves as well! 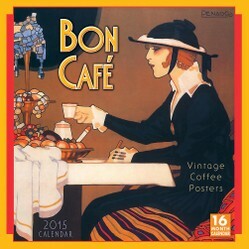 I love this wall calendar that celebrates vintage coffee posters! The graphics are bright and bold, and pleasing to the eye. The poster art featured here is from the early to mid-1900s, during a time when many advertisements were works of art in and of themselves. These coffee advertisement posters with their whimsical illustrations represent a few different countries. "Now coffee lovers can make delicious cappuccinos, cold coffee quenchers, decadent coffee desserts, and classy coffee martinis year-round using simple techniques with gourmet results in this indispensable coffee guide and cookbook." 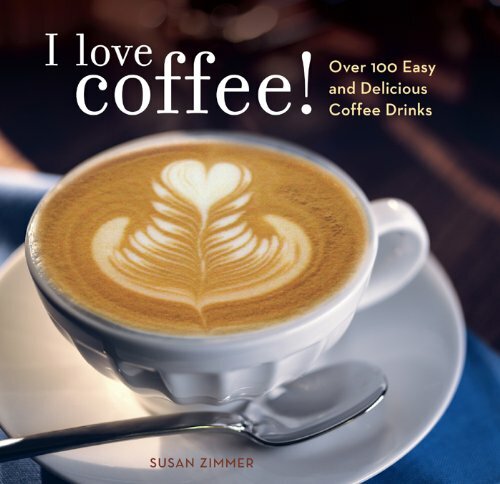 In this indispensable coffee drink book, Susan Zimmer shares expert advice and techniques on subjects such as how to brew the perfect cup, how to make a basic cappuccino without a machine, and tips for making masterful latte art designs. It is filledl with a wealth of coffee understanding from the "ground" up, from bean to cup, including international coffees and brewing techniques best suited to a variety of preferences, all topped off with plenty of problem-solving tips and delectable full-color photographs. Giving ornaments during the holiday season is a fun and inexpensive gift giving tradition. And giving a coffee-themed ornament could be the perfect way to show your friends that you're thinking of them and their favorite beverage. 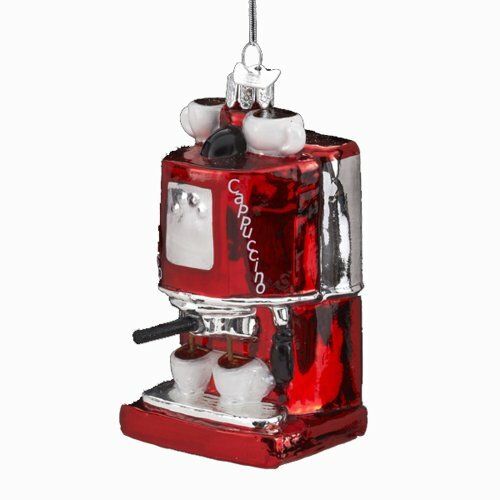 Maybe you can't afford to buy an Espresso machine for your favorite coffee lover....but you can get them this nicely detailed, cheery red 4" Kurt Adler espresso / cappuccino machine ornament. 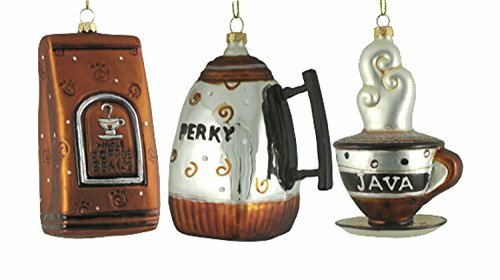 Or you can give them this set of three glass blown ornaments depicting a percolator, coffee cup, and a bag of coffee beans, also by Kurt Adler. Browse on Amazon for other fun ornaments such as a miniature 4-pack of Starbucks coffee, or other miniature coffee mugs. 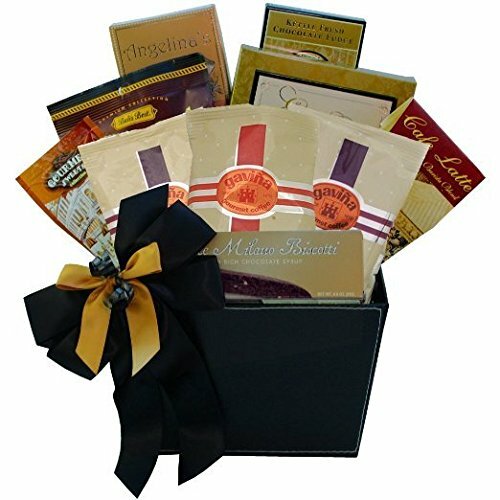 There are many different gift basket choices that you can choose from for your coffee-loving friends and family, ranging from smaller and more affordable, to higher priced options. The gift basket below is representative of a number of baskets that are available through Amazon, and is on the less expensive side compared to other gift baskets. It comes with a few samples of coffees and coffee drink mixes, and some other treats such as cookies, toasted almonds, and biscotti. The contents may vary, depending on what the company has on hand, and are packaged up in an attractive caddy that can be used later for home or office organization.